The sailors were in an aircraft that crashed into the Philippine Sea on Nov. 22. Two days after an aircraft crashed into the Philippine Sea, the U.S. Navy has ended its search for three missing sailors. The C-2A Greyhound went down Nov. 22 southeast of Okinawa, Japan, on its way to the USS Ronald Reagan. Eleven people were on board the aircraft. It's unclear what caused the crash. Eight personnel were rescued shortly after the crash and are reported to be in good condition. Rescue teams searched for the missing sailors for two days, covering an area of almost 1,000 square nautical miles. 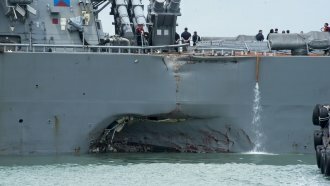 Officials will release the names of the missing sailors once next-of-kin notifications are complete. An investigation into the circumstances of the crash is underway.